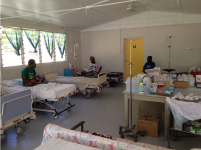 The International Rotary Project – the Godden Memorial Hospital Project in Vanuatu was taken up by Rotary Havelock North and once again Kevin Longman took up the challenge to lead a team from our club in 2015 and then last month he returned with another group including Dale Prebble and club members Rob and Charlie. They went to help finish the work started in 2015. This year our club contributed $7500.00 towards the trip to Ambae one of 80 islands in Vanuatu. Kevin - Kevin talked about the guest house where they stayed and did all their cooking mainly with the food they took with them There were five in the group as they were joined by Ross, a Rotarian from Auckland. They worked with nine local boys and his PowerPoint presentation showed photos of the area, the roads, the buildings including the hospital and the beautiful island scenery. He showed photos comparing the work done on the project in 2015 and today. Dale - Dale thanked the club for allowing him to join the group. He spoke about the primitive conditions, the flight to the island and travelling by ute to their lodge. While there he made a visit to a local boys boarding school and found the conditions and hygiene wanting. Charlie - Charlie talked about the team of boys they worked with. Four were from the original team and each had their own attributes and skills. Three new boys worked with Charlie and learned quickly not to mess with Charlie. They were interesting boys and had to toe the line. Charlie said it was a great experience working with and teaching these guys and while he was on the island made wonderful friends especially the young children and he realised just how basic life is for them. Rob - Rob was the Supplies Officer (linguistic solutions manager as he preferred to be known as). Supplies of bread was a challenge but he was able to source tools, paint, beer and wine from a store some distance away which he called Mitre 1. They had a meal at a cafe which served mainly chicken wings and rice - interesting food made for a problem diet. Water was a problem especially good water (rainwater) which was in short supply. He also accompanied Dale on the visit to the school and although it was quite well set out it was very poorly maintained. 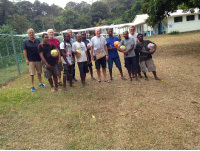 All team members thanked the club for the financial assistance to go to Vanuatu and in turn, the club was very grateful for the time and effort each team member made to the project. They are concerned about the volcano alert of 5 on the island at present and to hear that people have been evacuated and that ash cloud is coating everything including the lovely white paint job they did on the hospital.